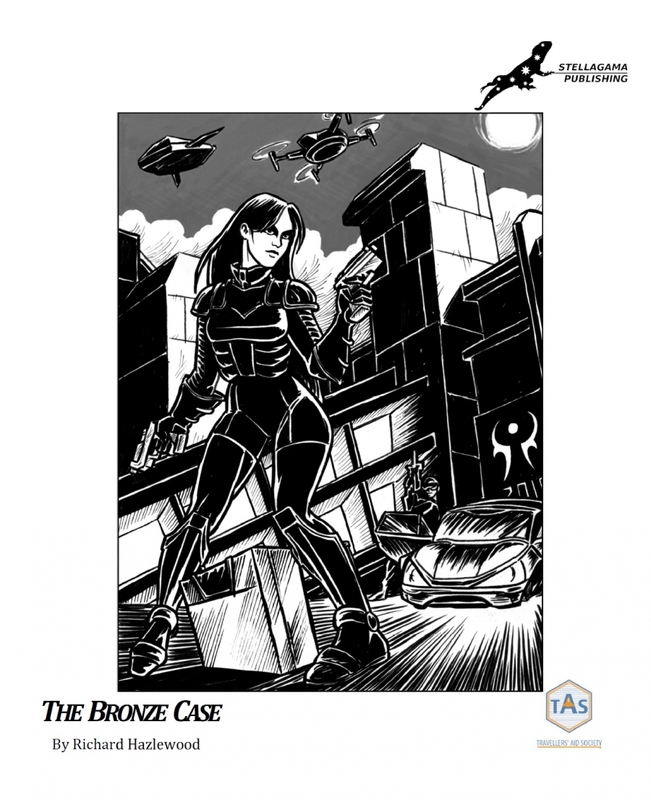 The Bronze Case is a new release by Stellagama Publishing for Mongoose Traveller 2nd edition and is released under the Open Game License / Community Content Agreement for the Travellers’ Aid Society. The 20-page PDF is available via DrivethruRPG for a very reasonable $4.99. The book details an adventure that can be run as a quick evenings game or form a diversion during a larger campaign. The background describes the players getting involved (somewhat by accident) with the central character named Amy. Without giving too much of the adventure away, Amy as the name of the adventure suggests has a bronze case that various parties want to get hold of. The adventure is well structured, broken down into five distinct parts. The style of writing is engaging, without the reader getting too bogged down by hugely detailed descriptions or conversely by being overly simplistic. The world that the players are currently located on does have some restrictions which will hinder the players in assisting Amy and their overall objective. There were a couple of situations in the adventure that came to mind that I think the most appropriate background music would be from the original ‘Terminator’ films where Arnold Schwarzenegger strides in slow-motion and storms the police station; a nicely-written situation that got the imagination going…! It’s a fast-paced adventure; the referee will need to keep on their toes to make sure the players do not get any respite or chance to recoup. That way they will be able to make the most of the opportunities to damage the players as much as possible. There are some tough characters, so once the players get out of the other side of the adventure (assuming they are one piece! ), there is scope for these tough’s to reappear should the referee wish to bring them back and be a recurring thorn in their side. A nice touch I’d like to mention; the writer has made the flow of events quite straightforward and describes a couple of outcomes which either allow the adventure to continue or to end there, with some form of result for the players. There are full character statistics provided for Mongoose Traveller, but if you are looking for a book with lots of artwork, this is not it. There are a couple of black-and-white illustrations by Luigi Castellani which are of the highest quality (see the cover above) which for the size of the adventure, is about right; any more and I think it could be interpreted as ‘padding out’ the book. In some ways they remind me of some of the Traveller T20 publications (I can’t remember exactly what but it was some adventures or supplements I’d seen with a similar style of monochrome artwork). It’s a well edited and laid-out book, which I thoroughly enjoyed reading. The Bronze Case is an enjoyable, action-packed dash which should prove to be reasonable challenge to a bunch of PCs. I highly recommended it and I look forward to seeing more from Stellagama Publishing. I would like to thank Omer Golan-Joel for being kind enough to send me a copy to review. This entry was posted in Classic Traveller, Mongoose Traveller, Mongoose Traveller Second Edition and tagged Mongoose Traveller, second edition, Stellagama Publishing, The Bronze Case. Bookmark the permalink.